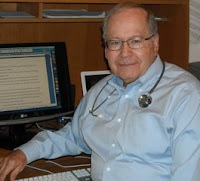 After his retirement from a distinguished career as a physician and medical educator, Richard turned his talents to non-medical writing. 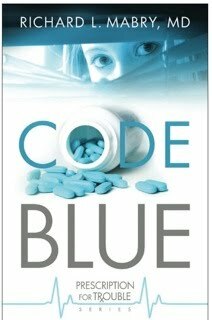 Code Blue is his debut novel, the first of the Prescription For Trouble series, featuring medical suspense. Richard and his wife, Kay, make their home in North Texas, where he continues his struggles to master golf and be the world’s most perfect grandfather. The black SUV barreled out of nowhere, its oversized tires straddling the centerline. Cathy jerked the steering wheel to the right and jammed the brake pedal to the floor. Her little Toyota rocked as though flicked by a giant hand before it spun off the narrow country road and hurtled toward the ditch and the peach orchard beyond it. For a moment Cathy felt the fearful thrill of weightlessness. Then the world turned upside down, and everything went into freeze-frame slow motion. The floating sensation ended with a jolt. The screech of ripping metal swallowed Cathy’s scream. The deploying airbag struck her face like a fist. The pressure of the shoulder harness took her breath away. The lap belt pressed into her abdomen, and she tasted bile and acid. As her head cleared, she found herself hanging head-down, swaying slightly as the car rocked to a standstill. In the silence that followed, her pulse hammered in her ears like distant, rhythmic thunder. Cathy realized she was holding her breath. She let out a shuddering sigh, inhaled, and immediately choked on the dust that hung thick in the air. She released her death-grip on the steering wheel and tried to lift her arms. It hurt—it hurt a lot—but they seemed to work. She tilted her head and felt something warm trickle down her face. She tried to wipe it away, but not before a red haze clouded her vision. She felt a burning sensation, first in her nostrils, then in the back of her throat. Gasoline! Cathy recalled all the crash victims she’d seen in the emergency room—victims who’d survived a car accident only to be engulfed in flames afterward. She had to get out of the car. Now. Her fingers probed for the seatbelt buckle. She found it and pressed the release button. Slowly. Be careful. Don’t fall out of the seat and make matters worse. The belt gave way, and she eased her weight onto her shoulders. She bit her lip from the pain, rolled onto her side, and looked around. How could she escape? She tried the front doors. Jammed—both of them. She’d been driving with her window partially open, enjoying the brisk autumn air and the parade of orange and yellow trees rolling by in the Texas landscape. There was no way she could wriggle through that small opening. Cathy drew back both feet and kicked hard at the exposed glass. Nothing. She kicked harder. On the third try, the window gave way. Where was her purse? Never mind. No time. She had to get out. Cathy inched her way through the window, flinching as tiny shards of glass stung her palms and knees. Once free from the car, she lay back on the grass and looked around at what remained of the orchard, blessing the trees that had sacrificed themselves to cushion her car’s landing. She rose unsteadily to her feet. It seemed as though every bone in her body cried out at the effort. The moment she stood upright the world faded into a gray haze. She slumped to the ground and took a few deep breaths. Her head hurt, her eyes burned, her throat seemed to be closing up. The smell of gasoline cut through her lethargy. She had to get further away from the car. How could she do that, when she couldn’t even stand without passing out? Cathy saw a peach sapling a few feet away, a tiny survivor amid the ruins. She crawled to the tree, grabbed it, and walked her hands up the trunk until she was almost upright. She clung there, drained by the exertion, until the world stopped spinning. Something dripped into her eyes and the world turned red. Cathy risked turning loose with one hand and wiped it across her face. Her vision cleared a bit. She regarded the crimson stain on her palm. Good thing she was no stranger to the sight of blood. Now she was upright, but could she walk? Maybe, if she could stand the pain. She wasn’t sure she could make it more than a step or two, though. A stout limb lying in the debris at her feet caught her eye. It was about four feet long, two inches thick—just the right size. Cathy eased her way down to a crouch, using the sapling for support. She grabbed the limb and, holding it like a staff, managed to stand up. She rested for a moment, then inched her way along the bottom of the ditch, away from the car. When she could no longer smell gasoline and when her aching limbs would carry her no farther, she leaned on her improvised crutch to rest. Cathy stared at the road above her. The embankment sloped upward in a gentle rise of about six feet. Ordinarily, climbing it would be child’s play for her. But right now she felt like a baby—weak, uncoordinated, and fearful. Maybe if she rested for a moment on that big rock. She hobbled to it and lowered herself, wincing with each movement. There was no way she could get comfortable—even breathing was painful—but she needed time to think. Had the SUV really tried to run her off the road? She wanted to believe it was simply an accident, that someone had lost control of his vehicle. Just like she’d wanted to believe that the problems she’d had since she came back home were nothing more than a run of bad luck. Now she had to accept the possibility that someone was making an effort to drive her out of town. She’d never thought much about the name of her hometown: Dainger, Texas. She vaguely recalled it was named for some settler, long ago forgotten. Now she was thinking the name seemed significant. Danger. Had the problems she’d left behind in Dallas followed her? Or did the roots lie here in Dainger? Possibly. After all, small towns have long memories. Of course, there could be another explanation. . . . No, she couldn’t accept that. Not yet. Cathy turned to survey the wreckage of her poor little car. She saw wheels silhouetted against the sky, heard the ticking of the cooling motor. Then she picked up new sounds: the roar of a car’s engine, followed by the screech of tires and the chatter of gravel. It could be someone stopping to help. On the other hand, it could be the driver of the SUV coming back to finish the job. She thought of hiding. But where? How? No chance to get away now. She’d have to take her chances and pray that he was really here to help. Pray? That was a laugh. Cathy had prayed before, prayed hard, all without effect. Why should she expect anything different this time? “Yes,” she croaked a bit stronger. A head peered over the edge of the embankment, but pulled back before she could get more than a glimpse of him. In a few seconds, he scrambled down the embankment, skidding in the red clay before he could dig in the heels of his cowboy boots. At the bottom he looked around until he spotted her. He half-ran the last few feet to where she stood swaying on her makeshift crutch. Blood trickled into her eyes again, and even after she wiped it away, it was like looking through crimson gauze. Cathy could make out the man’s outline but not his features. He sounded harmless enough. But she supposed even mass murderers could sound harmless. He leaned down and Cathy put her left arm on his shoulder. He encircled her waist with his right arm, supporting her so her feet barely touched the ground as they shuffled toward the slope. At the bottom, he turned and swept her into his arms. The move took her by surprise, and she gasped. She felt him stagger a bit on the climb, but in a moment they made it to the top. Cathy leaned back and tried to calm down. His voice sounded familiar. Was he one of her patients? She swiped the back of her hand across her eyes, but the image remained cloudy. She listened as he described the accident location in detail—a mile south of the Freeman farm, just before the Sandy Creek Bridge. This wasn’t some passer-by. He knew the area. “I don’t need an ambulance,” Cathy protested. Will Kennedy? If she hadn’t been sitting down, Cathy might have fallen over. She scrubbed at her eyes and squinted. Will? Yes, it was Will. Now even the shape of his body looked familiar: lean and muscular, just the way he’d been—. No. Don’t go there. He took a clean handkerchief from the hip pocket of his pressed jeans and gently cleaned her face. The white cotton rapidly turned red, and Cathy realized that the blood had not only clouded her vision. It had masked her features. Cathy opened her mouth to speak, but Will’s cell phone rang. He answered it and walked away as he talked, while she sat and wondered what would have happened if they’d never turned each other loose in the first place. As the ambulance sped toward Summers County General Hospital, Cathy wondered what kind of reception she would get there. Who would be on duty? Would they acknowledge her as a colleague, even though she hadn’t been given privileges yet? When her thoughts turned to recent events, she forced herself to shut down the synapses and put her mind into neutral. The ambulance rocked to a halt outside the emergency room doors. Despite Cathy’s protestations, the emergency medical technicians kept her strapped securely on the stretcher while they offloaded it. Inside the ER, Cathy finally convinced her guardians to let her transfer to a wheelchair held by a waiting orderly. At the admitting desk, the clerk looked up from her computer and frowned. “Dr. Patel. He just called in Dr. Bell to see a patient. Dr. Patel thought it might be a possible appendix.” She lowered her voice. “Dr. Bell took one look and made the diagnosis of stomach flu. I couldn’t see the need to call in another doctor for a consultation, but Dr. Patel is so afraid he’ll make a wrong diagnosis.” She pursed her lips as she realized her mistake of complaining about one doctor to another. Judy reached for the phone. Cathy eased her head around to see Marcus Bell standing behind her. He wore khakis and a chocolate-brown golf shirt, covered by an immaculate white coat with his name embroidered over the pocket. This was a trade Cathy would gladly make—finicky Dr. Patel for superdoc Marcus Bell. In the three years he’d been here, Marcus had built a reputation as an excellent clinician. He was also undoubtedly the best-looking doctor in town. Marcus stepped discreetly from the room. Marianne helped Cathy out of her clothes and into a hospital gown. If Cathy had felt vulnerable before this, the added factor of being in a garment that had so many openings closed only by drawstrings tripled the feeling. The nurse eased Cathy onto the examining table, covered her with a clean sheet, and called Marcus back into the room. “Now, Cathy, the first thing I want to do is have a closer look at that cut on your head.” Marcus slipped on a pair of latex gloves and probed the wound. “Not too bad. One laceration about three or four centimeters long in the frontal area. Not too deep. The bleeding’s almost stopped now. We’ll get some skull films, then I’ll suture it.” He wound a soft gauze bandage around her head and taped it. At first, Cathy laid out the details of the accident and her injuries in terse clinical language, as though presenting a case to an attending physician at Grand Rounds. She did fine until she realized how close she’d come to being killed, apparently by someone who meant to do just that. There were a couple of strangled hiccups, then a few muffled sobs, before the calm physician turned into a blubbering girl. “I’m . . . I’m sorry.” She reached for a tissue from the box Marcus held out. “Oh, right.” The fact that she hadn’t thought of that underscored to Cathy how shaken she still was. “That’s not true. I don’t— Ow!” His hand on the point of her right shoulder sent a flash of pain along her collarbone. This time she got through the story without tearing up, although Marcus’s efforts to find something broken or dislocated brought forth a number of additional flinches and exclamations. “I really do think I’m fine except for some bruises,” she concluded. “I’m here,” the nurse replied. No sooner had the nurse closed the door than there was a firm tap on it. The door creaked open, and Cathy turned. The pain that coursed through her neck made her regret the decision. A man in starched, immaculate whites strode into the room and stopped at an easy parade rest. A smattering of gray at the temples softened the red in his buzz-cut hair. “Pleasure to meet you, Doctor,” Jerry said. Cathy half- expected Jerry to salute Marcus. Instead, he nodded silently before helping her off the exam table and into a wheelchair. That’s why I was taking a drive on Saturday afternoon. Filling the empty hours. That started a chain of thought Cathy didn’t want to pursue. Instead, she concentrated on getting through the next few minutes. The X-rays took less time and caused less discomfort than Cathy expected. She could see why Marcus thought so highly of Jerry. Soon she was back in the treatment room, lying on the examination table. Jerry put up two of the X-rays on the wall view box and stacked the others neatly on the metal table beneath it. Cathy assured Jerry that she was fine, although she finally realized how many bumps and bruises she’d accumulated in the crash. Every movement seemed to make something else hurt. When she thought about what came next, her anxiety kicked into high gear. Would Marcus have to shave her scalp before placing the stitches? She recalled her own experiences suturing scalp lacerations in the Parkland Hospital Emergency Room. Maybe it was a woman thing, but she’d felt sorry for those patients, walking out with a shaved spot on their head, a bald patch that was sometimes the size of a drink coaster. She hated the prospect of facing her patients on Monday in that condition. Truthfully, she even hated the prospect of looking at herself in the mirror. She was thinking about wigs when Marcus reentered the room. Cathy was surprised when Marcus didn’t call for help, but rather assembled the necessary instruments and equipment himself. When he slipped his gloves on, she closed her eyes and gritted her teeth. The fact that she’d been on the other end of this procedure hundreds of times just made her dread it more. Marcus’s touch was gentle as he cleaned the wound. Soon she felt the sting of a local anesthetic injection. After that, there was nothing except an occasional tug as he sutured. Cathy couldn’t believe what she’d heard. “Natural beauty?” This was certainly at odds with what she’d been told about Marcus Bell. Since the death of his wife, Marcus apparently wanted nothing to do with women. Rumor had it he’d turned aside the advances of most of the single women in Dainger. Was he flirting with her now? Or was this simply his bedside manner? “Okay, I get it. I’ll stop being my own doctor,” she said. Once more, Cathy felt her head spin, but this time it had nothing to do with tumbling. about in a runaway auto. Cathy had always dreaded Monday mornings, but none so much as this one. Today it was time to show her face to the world. She took one last look in the mirror. Cathy had figured that her fair complexion would make her bruises show up like tire tracks on fresh snow, but the judicious application of some Covermark had done its job well. The redness she’d noticed in her eyes two days ago had responded well to the eye drops Marcus prescribed. And, true to his prediction, she’d been able to style her hair so that the blonde strands almost hid the stitches in her scalp. A little more lipstick and blusher than usual, drawing attention to her face instead of her hair, and maybe she could fake her way through the day. No matter how successful she’d been in covering the outward signs of the accident, it was still impossible for her to move without aches and pains. She popped a couple of Extra Strength Tylenol, washed them down with the remnants of her second cup of coffee, and headed out the door to face another week. If the medication kicked in soon, maybe Jane wouldn’t notice that Cathy moved like an old woman. Maybe Jane hadn’t heard the news about the accident. Yeah, and maybe the President would call today and invite Cathy to dinner at the White House. What a break it had been for her when Jane—a trim, silver-haired grandmother with a sassy twinkle in her eye—answered her ad for a combination office nurse and secretary. She’d helped Cathy set up the office, given her advice on business, and provided a sympathetic ear on more occasions than she could count. Cathy recognized Jane’s question as rhetorical. Having grown up in Dainger, Cathy knew how quickly news spread in her hometown. She’d bet that Jane had known about the accident before Cathy had cleared the emergency room doors on Saturday. By now, probably everyone in town knew. Cathy frowned. A “nice light schedule” for a doctor just getting started as a family practitioner wasn’t exactly the stuff she dreamed about. She needed patients. The money from the bank loan was about gone, and her income stream was anything but impressive. But, she’d do the best she could. Anything had to beat living in Dallas, knowing she might run into Robert. Speak of the devil. Cathy actually shuddered when she saw the return address on the envelope sitting in the middle of her desk: Robert Edward Newell, M.D. She clamped her jaws shut, snatched up a brass letter opener, and ripped open the envelope. Inside were two newspaper clippings and a few words scribbled on a piece of white notepad with an ad for a hypertension drug at the top of the page. The first clipping announced the engagement of Miss Laura Lynn Hunt, daughter of Dr. Earl and Mrs. Betty Hunt, to Dr. Robert Edward Newell. The second featured a photo of Laura Lynn and Robert, she in a high couture evening gown, he in a perfectly fitting tux, arriving at the Terpsichorean Ball. The note was brief and to the point: “See what you’ve missed?” No signature. Just a reminder, one that made her grit her teeth until her jaws ached. Leave it to Robert to rub salt in her wounds. She forced herself to sit quietly and breathe deeply, until the knot in her throat loosened. Then she wadded the clippings and note into a tight ball, which she consigned to the wastebasket with as much force as she could muster. Jane returned and deposited a pitifully small stack of thin charts on Cathy’s desk. The look in Jane’s eyes said it all. Sorry there aren’t more. Sorry you’re hurting. Sorry. “Did you report it?” Jane asked. “He came along right after the wreck. When I couldn’t manage under my own power, Will carried me up the embankment. Then he insisted I go to the emergency room, and when they were loading me into the ambulance he slipped his card into my hand and whispered, ‘Please call me. I want to make sure you’re okay.’” Cathy pulled a business card from the pocket of her skirt, smoothed the wrinkles from it, and put it under the corner of her blotter. Before Jane could finish, Cathy spun around in her chair and pulled a book at random from the shelf behind her. “Not now. Please. I need to look up something before I see my first patient.” She paged through the book, but none of the words registered. “You’re a fighter, and I’m right here with you. Just stick with it.” Jane turned and walked toward the doorway.